Catalytic projects for homes, parks, retail corridors are changing neighborhood. Neighborhood kids check out the new playground at the opening of the newly renovated Arlington Heights Park in September 2015. Photo courtesy of Zilber Family foundation. 1) Turnkey Homes: Layton Boulevard West Neighbors bought, renovated and sold 23 foreclosed homes, in which it installed solar energy that helped reduce utility bills. The block parties and pre- and post-renovation tours that LBWN organized to market the homes increased resident engagement in the community and built connections between neighbors. 2) School Model Block: This project is rooted in the idea that focusing time, energy and investment in concentrated areas around neighborhood schools would bring more visible improvement and a greater sense of progress than would implementing the same improvements on scattered blocks. This strategy was used successfully around the Anna F. Doerfler School in Silver City and later the ALBA (Academia de Lenguaje y Bellas Artes) and Carmen High School of Science & Technology, South Campus, which share a building in Burnham Park. 3) Arlington Heights Park: The once-dilapidated park under Silver City’s 35th Street viaduct was renovated in 2015 through the MKE Plays initiative. The park features a new playground, bandshell, rain garden, lights and staircase decorated with a mosaic mural. 4) Greenfield Avenue Improvements: The major commercial corridor was repaved and bike paths and bumpouts were added between 35th Street and Cesar Chavez Drive. Construction began in March 2018 and was completed in November. 5) Burnham Park: Milwaukee Recreation and Epic Center Community Organization opened an ice skating rink in 2017. 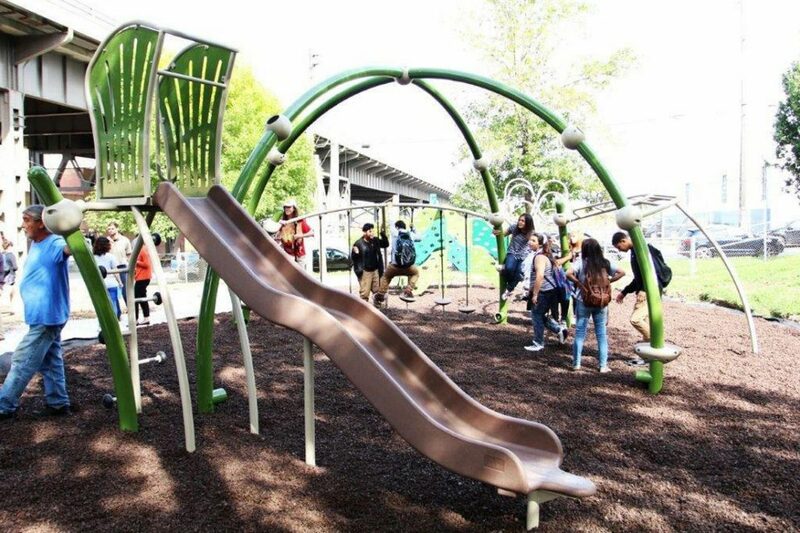 LBWN and Milwaukee Public Schools, whose recreation department manages the city-owned park at 35th and Burnham, have raised $1.6 million for the renovation of the east side of the park. Construction on ADA-accessible upgrades to the field house, a new splash pad, basketball courts, playground, walking paths and lighting will take place in 2019. 6) Layton Boulevard West Legacy Homes: The Frank Lloyd Wright American System houses on Burnham Avenue are maintained and promoted by Frank Lloyd Wright’s Burnham Block, Inc., a spin-off of Wright in Wisconsin established in 2017. LBWN also promotes this block and other historic architecture as neighborhood assets. 7) Silver City Commercial Corridor: LBWN has purchased and revitalized many vacant commercial properties by seeking out, incentivizing and supporting new businesses as tenants and property owners. 8) Pierce Street: New developments (including the affordable rent-to-own Silver City Town Homes, the Urban Ecology Center, Velobahn Coffee and the Milwaukee Bike Federation), along with the renovation of Arlington Heights Park and installation of a raised intersection to calm the resulting vehicular traffic have transformed this Silver City corridor. 9) Welcome to our Community! 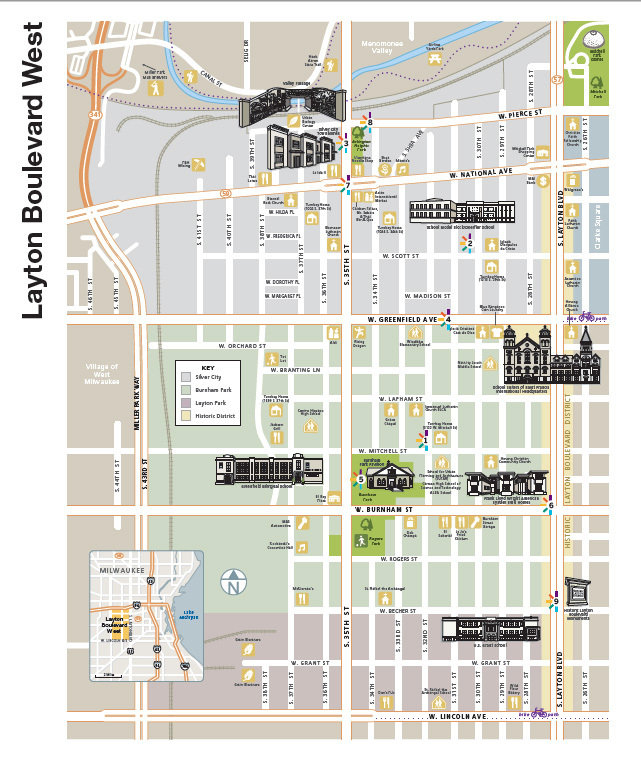 : Historic Layton Boulevard markers, signs bearing neighborhood logos and flags on residences have been installed throughout the neighborhoods. This year, art installations welcoming people to Silver City were erected at 35th Street and National Avenue and at 37th and Pierce streets. 10) Resource/Community Center: The Urban Ecology Center opened a Menomonee Valley branch at 3700 W. Pierce St. in September 2012. 11. Farmers Market: The need for fresh local produce was met when the nearby Jackson Park Farmers Market, which operates in summer, and the Winter Farmers Market at the Domes, across the street in Clarke Square, opened. Catalytic projects in Layton Boulevard West.